Residents and allies held two events on January 11 to mark 1,000 days that hundreds of North Carolina families living near coal ash ponds have been forced to rely on bottled water because their tap water is contaminated. 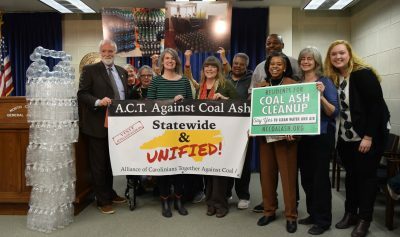 The first event was a press conference at the North Carolina General Assembly building with state representatives and senators whose districts have been impacted by coal ash. The second press conference was held outside Duke Energy’s downtown Charlotte headquarters. At the Raleigh event, attendees stood with a huge tower made of water bottles and held posters showing giant stacks of bottled water in their homes. An average family uses about 25 16-oz bottles of water a day. “This is a daily reminder that Duke Energy is inside the doors and inside the homes of these families every single day,” Amy Adams, North Carolina Program Manager told the crowd. Though the inconvenience and psychological trauma that impacted residents face from living on bottled water is stark, the alternative threat that drinking contaminated groundwater poses to human health is greater. Many community members who live outside of the half-mile boundary that determines whether or not Duke Energy has been providing bottled water are still at risk from ash-tainted groundwater. “Do you realize the significant change that this has made in our lives? In our neighborhood, there is so much sickness. My immediate family has been hit just this past year. How much more of this does our community have to live through for our community to get the attention of Duke Energy, regulators, the public and government officials?” said Sara Mullins, Goldsboro resident. It is for these reasons that coal ash community members and their allies used the 1,000th day mark to call for Duke Energy to remove the source of contamination from these communities so that neighbors outside of the arbitrary half-mile boundary and those slated to receive filtration systems will be protected. Although Duke Energy claims that its plant operations have had no impact on groundwater, the company’s removal of ash from its power stations in South Carolina tells a different story. Arsenic levels before and after excavation reveal a 95-99% decrease across monitoring wells. “I urge the leadership of the legislature and Department of Environmental Quality to demand that Duke Energy remove all of its coal ash from unlined pits and safely recycle it or store it above ground on Duke Energy’s property,” said Rep. John Autry of Mecklenburg County. This saga of groundwater impacts from coal ash, alongside the recent GenX controversy in eastern North Carolina, has coal ash neighbors, allies and legislators alike calling for stricter groundwater standards and for a fully-funded DEQy to catch and enforce violations. “It’s time for the state of North Carolina to set groundwater standards that are protective of human health for all 3.5 million North Carolinians who rely on groundwater,” said Adams. The federal Safe Drinking Water Act only protects Americans on public water systems. Contaminants found in private wells supplied by groundwater are only protected under state standards. Some contaminants found in wells of people living near coal ash ponds do not have official standards, but are enforceable to a certain limit. Hexavalent chromium, a cancer-causing chemical found in groundwater wells near coal ash ponds across the state, is not listed by the state and is instead lumped into “total chromium” at a limit 142 times higher than what is acceptable by the Department of Health and Human Services.